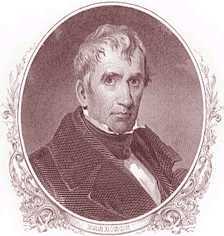 William Henry Harrison, ninth president of the United States, born in Berkeley, Charles City County, Virginia, 9 February, 1773; died in Washington, D. C., 4 April, 1841, was educated at Hampden Sidney college, Virginia, and began the study of medicine, but before he had finished it accounts of the Indian outrages that had been committed on the western frontier raised in him a desire to enter the army for its defense. Robert Norris, who had been appointed his guardian on the death of his father in 1791, endeavored to dissuade him, but his purpose was approved by Washington, who had been his father's friend, and he was commissioned ensign in the 1st infantry on 16 August, 1791. He joined his regiment at Fort Washington, Ohio, was appointed lieutenant of the 1st sub-legion, to rank from June, 1792, and afterward joined the new army under General Anthony Wayne. He was made aide-de-camp to the commanding officer, took part, in December, 1793, in the expedition that erected Fort Recovery on the battlefield where St. Clair had been defeated two years before, and, with others, was thanked by name in general orders for his services. He participated in the engagements with the Indians that began on 30 June, 1794, and on 19 August, at a council of war, submitted a plan of march, which was adopted and led to the victory on the Miami on the following day. Lieutenant Harrison was specially complimented by General Wayne, in his dispatch to the secretary of war, for gallantry in this fight, and in May, 1797, was made captain, and given command of Fort Washington. Here he was entrusted with the duty of receiving and forwarding troops, arms, and provisions to the forts in the northwest that had been evacuated by the British in obedience to the Jay treaty of 1794, and was also instructed to report to the commanding general on all movements in the south, and to prevent the passage of French agents with military stores intended for an invasion of Louisiana. While in command of this fort he formed an attachment for Anna, daughter of John Cleves Symmes. Her father refused his consent to the match, but the young couple were married in his house during his temporary absence, and Symmes soon became reconciled to his son-in-law. Peace having been made with the Indians, Captain Harrison resigned his commission on 1 June, 1798, and was immediately appointed by President John Adams secretary of the northwest territory, under General Arthur St. Clair as governor, but in October, 1799, resigned to take his seat as territorial delegate in congress. In his one year of service, though he was opposed by speculators, he secured the subdivision of the public lands into small tracts, and the passage of other measures for the welfare of the settlers. During the session, part of the northwest territory was formed into the territory of Indiana, including the present states of Indiana, Illinois, Michigan, and Wisconsin, and Harrison was made its governor and superintendent of Indian affairs. Resigning his seat in congress, he entered on the duties of his office, which included the confirmation of land grants, the defining of townships, and others that were equally important. Governor Harrison was reappointed successively by President Jefferson and President Madison. He organized the legislature at Vincennes in 1805, and applied himself especially to improving the condition of the Indians, trying to prevent the sale of intoxicating liquors among them, and to introduce inoculation for the small-pox. He frequently held councils with them, and, although his life was sometimes endangered, succeeded by his calmness and courage in averting many outbreaks. On 30 September, 1809, he concluded a treaty with several tribes by which they sold to the United States about 3,000,000 acres of land on Wabash and White rivers. This, and the former treaties of cession that had been made, were condemned by Tecumseh (q. v.) and other chiefs on the ground that the consent of all the tribes was necessary to a legal sale. The discontent was increased by the action of speculators in ejecting Indians from the lands, by agents of the British government, and by the preaching of Tecumseh's brother, the "prophet" (see ELLSKWATAWA), and it was evident that an outbreak was at hand. The governor pursued a conciliatory course, gave to needy Indians provisions from the public stores, and in July, 1810, invited Tecumseh and his brother, the prophet, to a council at Vincennes, requesting them to bring with them not more than thirty men. In response, the chief, accompanied by 400 fully armed warriors, arrived at Vincennes on 12 August The council, which was held under the trees in front of the governor's house, was nearly terminated by bloodshed on the first day, but Harrison, who foresaw the importance of conciliating Tecumseh, prevented, by his coolness, a conflict that almost had been precipitated by the latter. The discussion was resumed on the next day, but with no result, the Indians insisting on the return of all the lands that had recently been acquired by treaty. On the day after the council Harrison visited Tecumseh at his camp, accompanied only by an interpreter, but without success. In the following spring depredations by the savages were frequent, and the governor sent word to Tecumseh that, unless they should cease, the Indians would be punished. The chief promised another interview, and appeared at Vincennes on 27 July, 1811, with 300 followers, but, awed probably by the presence of 750 militia, professed to be friendly. Soon afterward, Harrison, convinced of the chief's insincerity, but not approving the plan of the government to seize him as a hostage, proposed, instead, the establishment of a military post near Tippecanoe, a town that had been established by the prophet on the upper Wabash. The news that the government had given assent to this scheme was received with joy, and volunteers flocked to Vincennes. Harrison marched from that town on 26 September, with about 900 men, including 350 regular infantry, completed Fort Harrison, near the site of Terre Haute, Indiana, on 28 October, and, leaving a garrison there, pressed forward toward Tippecanoe. On 6 November, when the army had reached a point a mile and a half distant from the town, it was met by messengers demanding a parley. A council was proposed for the next day, and Harrison at once went into camp. taking, however, every precaution against a surprise. At four o'clock on the following morning a fierce attack was made on the camp by the savages, and the fighting continued till daylight, when the Indians were driven from the field by a cavalry charge. During the battle, in which the American loss was 108 killed and wounded, the governor directed the movements of the troops, he was highly complimented by President Madison in his message of 18 Dec., 1811, and was also thanked by the legislatures of Kentucky and Indiana. On 18 June, 1812, war was declared between Great Britain and the United States. On 25 August, Governor Harrison, although not a citizen of Kentucky, was commissioned major-general of the militia of that state, and given command of a detachment that was sent to re-enforce General Hull, the news of whose surrender had not yet reached Kentucky. On 2 September, while on the march, he received a brigadier-general's commission in the regular army, but withheld his acceptance till he could learn whether or not he was to be subordinate to General James Winchester, who had been appointed to the command of the northwestern army. After relieving Fort Wayne, which had been invested by the Indians, he turned over his force to General Winchester, and was returning to his home in Indiana when he met an express with a letter from the secretary of war, appointing him to the chief command in the northwest. "You will exercise," said the letter, "your own discretion, and act in all cases according to your own judgment." No latitude as great as this had been given to any commander since Washington. Harrison now prepared to concentrate his force on the rapids of the Maumee, and thence to move on Malden and Detroit. Various difficulties, however, prevented him from carrying out his design immediately. Forts were erected and supplies forwarded, but, with the exception of a few minor engagements with Indians, the remainder of the year was occupied merely in preparation for the coming campaign. Winchester had been ordered by Harrison to advance to the Rapids, but the order was countermanded on receipt of information that Tecumseh, with a large force, was at the head-waters of the Wabash. Through a misunderstanding, however, Winchester continued, and on 18 January captured Frenchtown (now Monroe, Michigan), but three days later met with a bloody repulse on the river Raisin from Colonel Henry Proctor. Harrison hastened to his aid, but was too late. After establishing a fortified camp, which he named Fort Meigs, after the governor of Ohio, the commander visited Cincinnati to obtain supplies, and while there urged the construction of a fleet on Lake Erie. On 2 March, 1813, he was given a major-general's commission. Shortly afterward, having heard that the British were preparing to attack Fort Meigs, he hastened thither, arriving on 12 April. On 28 April it was ascertained that the enemy under Proctor was advancing in force, and on 1 May siege was laid to the fort. While a heavy fire was kept up on both sides for five days, re-enforcements under General Green Clay were hurried forward and came to the relief of the Americans in two bodies, one on each side of Maumee river. Those on the opposite side from the fort put the enemy to flight, but, disregarding Harrison's signals, allowed themselves to be drawn into the woods, and were finally dispersed or captured. The other detachment fought their way to the fort, and at the same time the garrison made a sortie and spiked the enemy's guns. Three days later Proctor raised the siege. He renewed his attack in July with 5,000 men, but after a few days again withdrew. On 10 September Commander Perry gained his victory on Lake Erie, and on 16 September Harrison embarked his artillery and supplies for a descent on Canada. The troops followed between the 20th and 24th, and on the 27th the army landed on the enemy's territory. Proctor burned the fort and navy yard at Malden and retreated, and Harrison followed on the next day. Proctor was overtaken on 5 October, and took position with his left flanked by the Thames, and a swamp covering his right, which was still further protected by Tecumseh and his Indians. He had made the mistake of forming his men in open order, which was the plan that was adopted in Indian fighting, and Harrison, taking advantage of the error, ordered Colonel Richard M. Johnson to lead a cavalry charge, which broke through the British lines, and virtually ended the battle. Within five minutes almost the entire British force was captured, and Proctor escaped only by abandoning his carriage and taking to the woods. Another band of cavalry charged the Indians, who lost their leader, Tecumseh, in the beginning of the fight, and afterward made no great resistance. This battle, which, if mere numbers alone be considered, was insignificant, was most important in its results. Together with Perry's victory it gave the United States possession of the chain of lakes above Erie, and put an end to the war in uppermost Canada. Harrison's praises were sung in the president's message, in congress, and in the legislatures of the different states. Celebrations in honor of his victory were held in the principal cities of the Union, and he was one of the heroes of the hour. He now sent his troops to Niagara, and proceeded to Washington, where he was ordered by the president to Cincinnati to devise means of protection for the Indiana border. General John Armstrong, who was at this time secretary of war, in planning the campaign of 1814 assigned Harrison to the 8th military district, including only western states, where he could see no active service, and on 25 April issued an order to Major Holmes, one of Harrison's subordinates, without consulting the latter. Harrison thereupon tendered his resignation, which, President Madison being absent, was accepted by Armstrong. This terminated Harrison's military career. In 1814, and again in 1815 he was appointed on commissions that concluded satisfactory Indian treaties, and in 1816 he was chosen to congress to fill a vacancy, serving till 1819. While he was in congress he was charged by a dissatisfied contractor with misuse of the public money while in command of the northwestern army, but was completely exonerated by an investigating committee of the house. At this time his opponents succeeded, by a vote of 13 to 11 in the senate, in striking his name from a resolution that had already passed the house, directing gold medals to be struck in honor of Governor Shelby, of Kentucky, and himself, for the victory of the Thames. The resolution was passed unanimously two years later, on 24 March, 1818, and Harrison received the medal. Among the charges that were made against him was that he would not have pursued Proctor at all, after the latter's abandonment of Malden, had it not been for Governor Shelby; but the latter denied this in a letter that was read before the senate, and gave General Harrison the highest praise for his promptitude and vigilance. While in congress, Harrison drew up and advocated a general militia bill, which was not successful, and also proposed a measure for the relief of soldiers, which was passed. In 1819 General Harrison was chosen to the senate of Ohio, and in 1822 was a candidate for congress, but was defeated on account of his vote against the admission of Missouri to the Union with the restriction that slavery was to be prohibited there. In 1824 he was a presidential elector, voting for Henry Clay, and in the same year he was sent to the United States senate, where he succeeded Andrew Jackson as chairman of the committee on military affairs, introduced a bill to prevent desertions, and exerted himself to obtain pensions for old soldiers. He resigned in 1828, having been appointed by President John Quincy Adams United States minister to the United States of Colombia. While there he wrote a letter to General Simon Bolivar urging him not to accept dictatorial powers. He was recalled at the outset of Jackson's administration, as is asserted by some, at the demand of General Bolivar, and retired to his farm at North Bend, near Cincinnati, Ohio, where he lived quietly, filling the offices of clerk of the county court and president of the county agricultural society. In 1835 General Harrison was nominated for the presidency by meetings in Pennsylvania, New York, Ohio, and other states; but the opposition to Van Buren was not united on him, and he received only 73 electoral votes to the former's 170. Four years later the National Whig convention, which was called at Harrisburg, Pennsylvania, for 4 December, 1839, to decide between the claims of several rival candidates, nominated him for the same office, with John Tyler, of Virginia, for vice president. The Democrats renominated President Van Buren. The canvass that followed has been often called the "log cabin and hard cider campaign." The eastern end of General Harrison's house at North Bend consisted of a log cabin that had been built by one of the first settlers of Ohio, but which had long since been covered with clapboards. The republican simplicity of his home was extolled by his admirers, and a political biography of that time says that "his table, instead of being covered with exciting wines, is well supplied with the best cider." Log cabins and hard cider, then, became the party emblems, and both were features of all the political demonstrations of the canvass, which witnessed the introduction of the enormous mass-meetings and processions that have since been common just before presidential elections. The result of the contest was the choice of Harrison, who received 234 electoral votes to Van Buren's 60. He was inaugurated at Washington on 4 March, 1841, and immediately sent to the senate his nominations for cabinet officers, which were confirmed. They were Daniel Webster, of Massachusetts, secretary of state; Thomas Ewing, of Ohio, secretary of the treasury; John Bell, of Tennessee, secretary of war; George E. Badger, of North Carolina, secretary of the navy; Francis Granger, of New York, postmaster-general; and John J. Crittenden, of Kentucky, attorney-general. The senate adjourned on 15 March, and two days afterward the president called congress together in extra session to consider financial measures. On 27 March, after several days of indisposition, he was prostrated by a chill, which was followed by bilious pneumonia, and on Sunday morning, 4 April, he died. The end came so suddenly that his wife, who had remained at North Bend on account of illness, was unable to be present at his death-bed. The event was a shock to the country, the more so that a chief magistrate had never before died in office, and especially to the Whig party, who had formed high hopes of his administration. His body was interred in the congressional cemetery at Washington; but a few years later, at the request of his family, it was removed to North Bend, where it was placed in a tomb, overlooking the Ohio river. This was subsequently allowed to fall into neglect, but afterward General Harrison's son, John Scott, deeded it and the surrounding land to the state of Ohio, on condition that it should be kept in repair. In 1887 the legislature of the state voted to raise money by taxation for the purpose of erecting a monument to General Harrison's memory. He was the author of a "Discourse on the Aborigines of the Valley of the Ohio" (Cincinnati, 1838). His life has been written by Noses Dawson (Cincinnati, 1834); by James Hall (Philadelphia, 1836); by Richard Hildreth (1839); by Samuel J. Burr (New York, 1840)" by Isaac R. Jackson; and by H. Montgomery (New York, 1853). --His wife, Anna, born near Norristown, New Jersey, 25 July, 1775; died near North Bend, Ohio, 25 February, 1864, was a daughter of John Cleves Symmes, and married General Harrison 22 November, 1795. After her husband's death she lived at North Bend till 1855, when she went to the house of her son, John Scott Harrison, a few miles distant. Her funeral sermon was preached by Horace Bushnell, and her body lies by the side of her husband at North Bend. --Their son, John Scott, born in Vincennes, Indiana, 4 October, 1804; died near North Bend, Ohio, 26 May, 1878, received a liberal education, and was elected to congress as a Whig, serving from 5 December, 1853, till 3 March, 1857.--A daughter, Lucy, born in Richmond, Virginia; died in Cincinnati, Ohio, 7 April, 1826, became the wife of David K. Este, of the latter city, and was noted for her piety and benevolence. --Benjamin, son of John Scott, senator, born in North Bend, Ohio, 20 August, 1833, was graduated at Miami university, Ohio, in 1852, studied law in Cincinnati, and in 1854 removed to Indianapolis, Indiana, where he has since resided. He was elected reporter of the state supreme court in 1860, and in 1862 entered the army as a 2d lieutenant of Indiana volunteers. After a short service he organized a company of the 70th Indiana regiment, was commissioned colonel on the completion of the regiment, and served through the war, receiving the brevet of brigadier-general of volunteers on 23 January 1865. He then returned to Indianapolis, and resumed his office of supreme court reporter, to which he had been re-elected during his absence in 1864. In 1876 he was the Republican candidate for governor of Indiana, but was defeated by a small plurality. President Hayes appointed him on the Mississippi river commission in 1878, and in 1880 he was elected United States senator, taking his seat on 4 March, 1881. Start your search on William Henry Harrison.